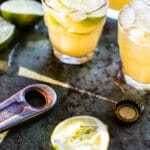 4-Ingredient Pineapple Lime Chelada (I made us a drink!) + Video. I made us a drink! 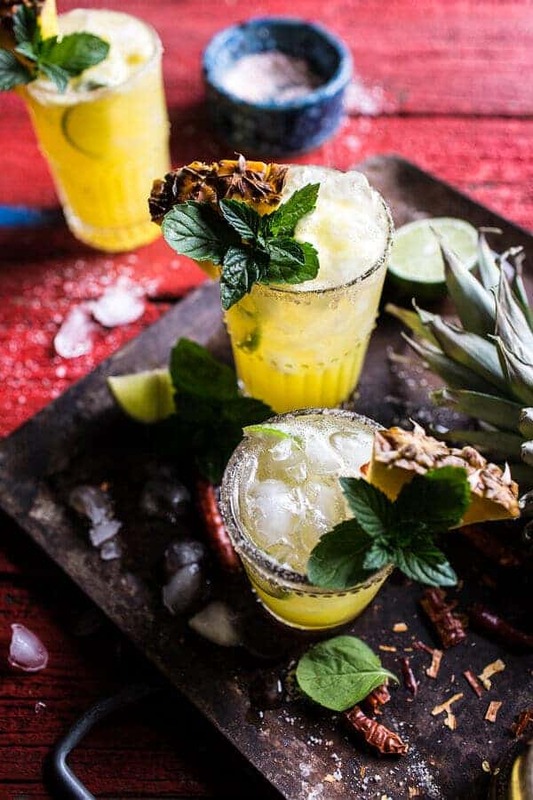 4 ingredient pineapple lime chelada drinks to exact! Or really for just whenever, but especially for summer!!! I will not lie, this is the perfect summer drink. I know it’s only May, but trust me, before you know it Memorial Day will be here and to me, that means summer! Don’t try to argue with my mindset here. SO. 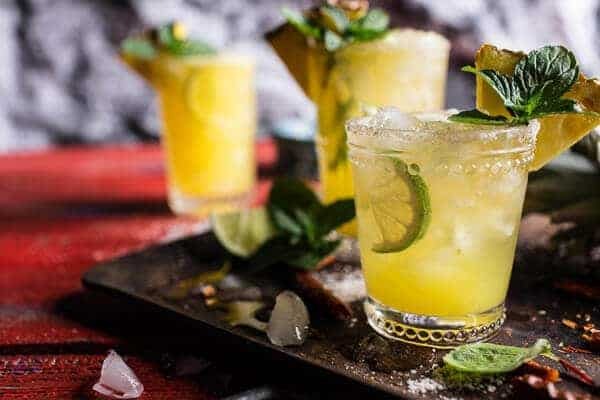 This 4-Ingredient Pineapple Lime Chelada is the perfect drink for today for many, many reasons. >>>Reason one: It’s light and refreshing AND oh so fun!! >>>Reason two: It will take you just five minutes tops to mix up. >>>Reason three: It’s low on calories, heavy on flavor. >>>Reason four: Cinco De Mayo falls on a Tuesday this year. 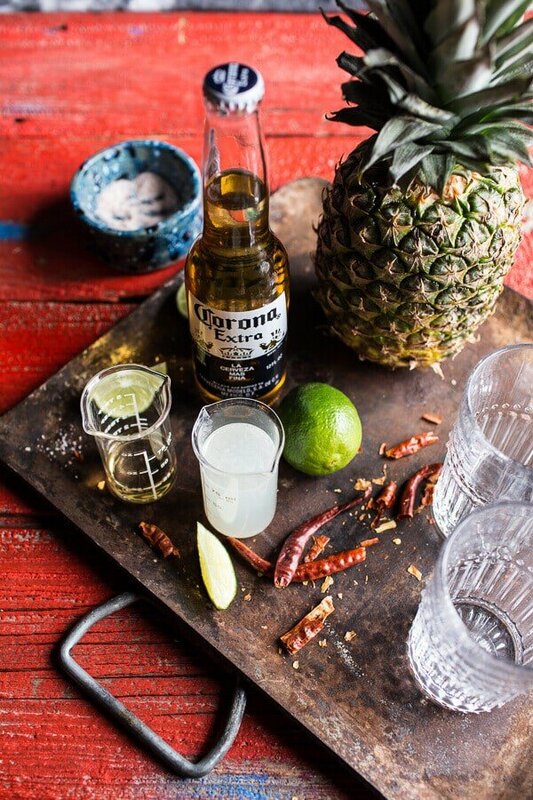 That means an easy, Mexi inspired drink is a MUST. Here’s the deal, I never thought I’d make a REAL drink. I mean, like a real grown up, adult, kind of drink. Sure I’ve made a chocolate martini and spiked hot cocoa. I’ve even made a firecracker margarita and a bellini smoothie, but with those drinks the alcohol was optional. I also made some sangria at Christmas with the help of my cousin Abby (not on the blog – yet). But this drink, this drink was all my idea, and I have to say, it was so much fun! You see, drinking alcohol is just really not my thing, but I have started to wonder a bit about drinks lately. Something about them is really intriguing to me. Maybe it’s because it’s uncharted territory, or maybe it’s because I am just getting a little bored with all my usuals, or maybe it’s because I have been dying to try my hand at photographing drinks, or maybe it’s because I wonder if life is just a little more fun with a drink in your hand. I am going to go with all of the above. PLUS…I maybe succumbed to a little peer pressure from the brother who has always wondered how I went through my teen years without even trying a beer. The answer? It just never interested me and to be brutally truthful, I am dead scared of not being 100% in control of my thoughts and actions. Can you say massive control freak? Yeah, I think so. Anyway, something kind of came over me the other day and realized it was time to be a grown up and create a drink. OR I actually really just wanted to take photos of a drink (cause I was bored with food), so I made a drink and am now completely OBSESSED with drink recipes. Let’s just say it is going to be a good summer full of cold drinks, both boozy and the not so much kind! Continuing on with my honesty here, I will say that I am still not a fan of straight up booze. 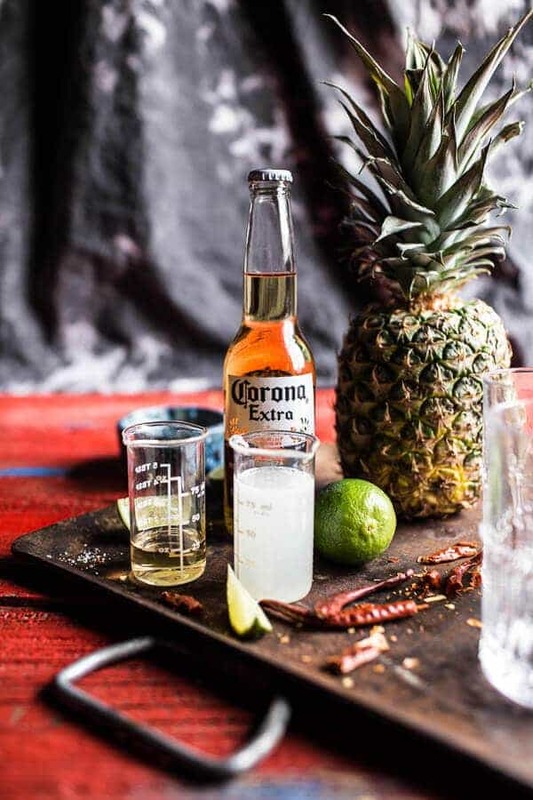 My chelada was mostly pineapple and lime with a tiny shot of Corona (gimme all the pineapple lime juice please!). 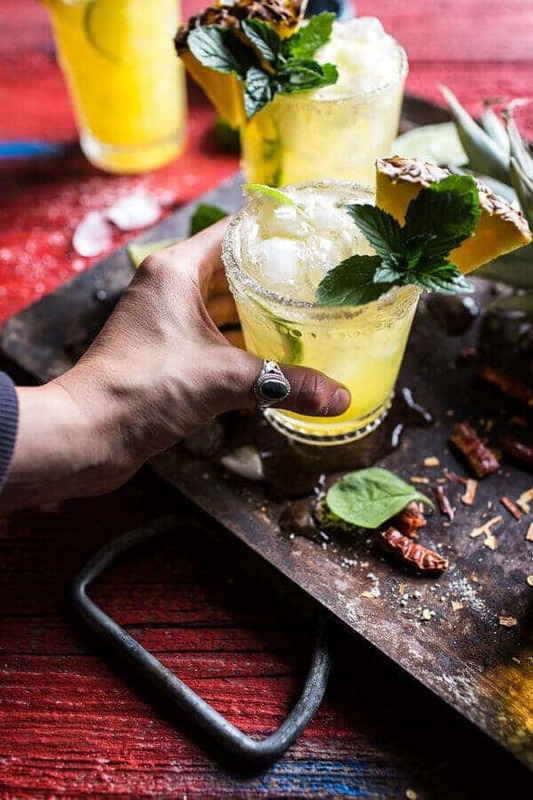 That’s just what works for me, I will never be a heavy on the booze kind of person, but I also do not want that to limit me from creating fun recipes like this one!! Everyone can add as little or as much booze as they’d like. Totally do what feels and tastes good to you! OH and umm…going to the liquor store is maybe the most uncomfortable thing for a twenty-one year old, who looks maybe sixteen (and my driver’s license picture makes me look even younger) and knows only that bourbon is good with chocolate and pecans and beer makes some of the BEST bread. These drinks are DELICIOUS. Everyone loved them. 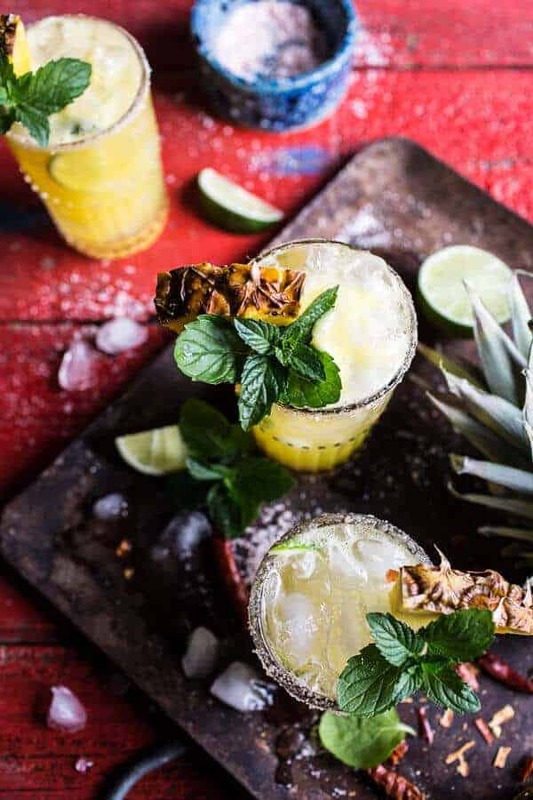 It’s kind of like a beer margarita, but just a lot easier and spiked with pineapple. Super refreshing and like I said before, very fun! I do feel I should say that, I had WAY too much of a good time photographing these drinks. I may sound like a complete dork, but new to me foods/drinks and the such are just so much fun for me. I basically had a giant smile on my face all day long. It was the best. I also planned it out that these drinks where ready to go around 6-ish on a Friday, which made it extra fun for everyone involved…which was really just my mom, cause my dad was at the gym, and I am lame and hang out with my mom on Friday nights. At least I know how to make a real deal drink now. I feel this is something everyone needs to know how to do. Life basics right?? And one more thing, please make sure to eat lots of tacos (or quesadillas today too). k??? 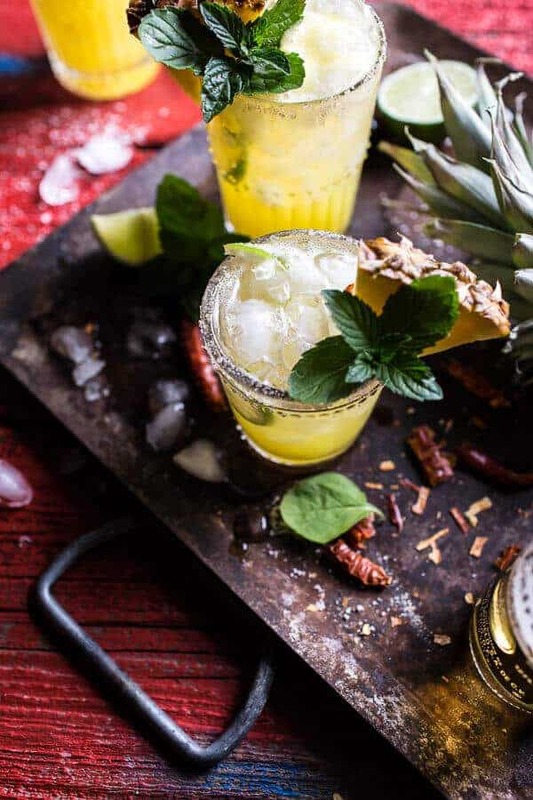 4-Ingredient Pineapple Lime Chelada (I made us a drink!). 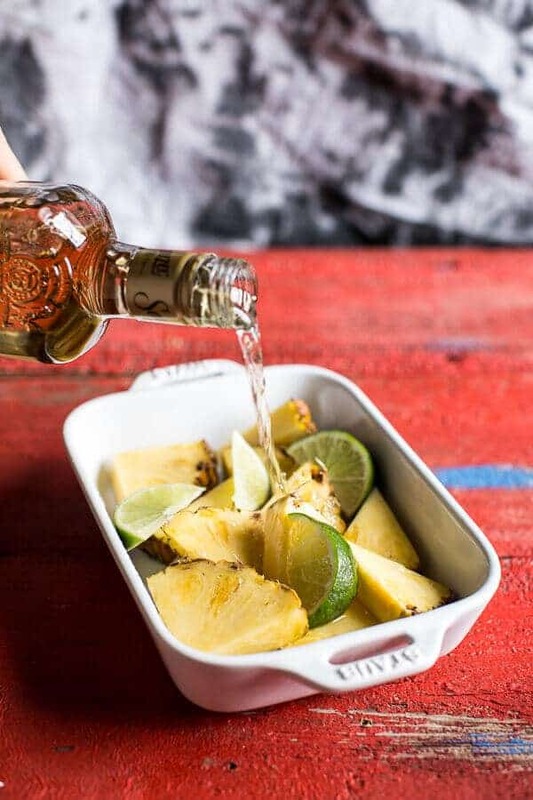 Add the pineapple wedges and lime wedges to a bowl and cover with tequila. Try and make sure the wedges are mostly submerged. I found using a shallow 8x8 inch baking dish worked best. Soak the pineapple for 1 hour or overnight. 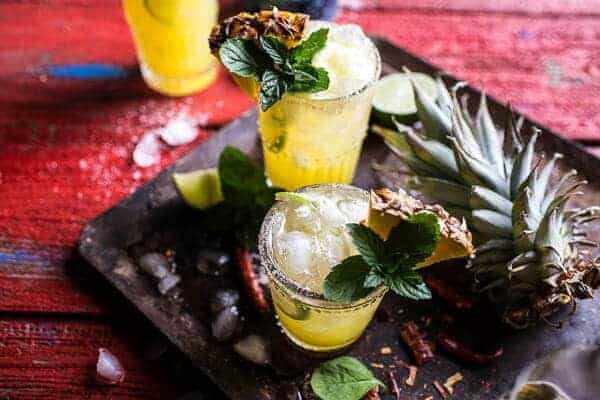 You can then use the pineapple to mix with the drink (remove the rind before blending) or to serve on the side of the drink. I used mine only on the side of my drinks and sprinkled them with a little salt + chili powder. Add the cubed pineapple and limeade to a blender and blend until smooth. Pour over a glass of crushed ice. Add the beer and tequila (if using) and stir to combine. 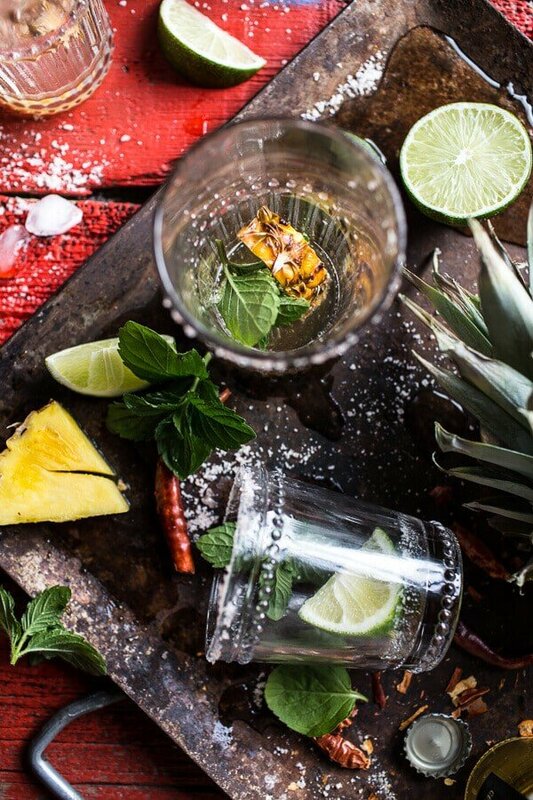 Garnish with a slice of pineapple and mint leaf if desired. And plenty of drinks for sipping! Happy Cinco De Mayo! P.S. My co-workers hate me for sending them all your tasty pictures right before lunch! These look so good I’m rethinking my Cinco de Mayo blackberry margaritas for tonight! THANKS! Happy Cinco De Mayo! 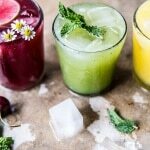 Drink recipes are seriously the best. I LOVE photographing them and this drink is stunning! I will take a virgin though this year 😉 But as soon as the baby is here, you better bet I will be whipping one of these up! 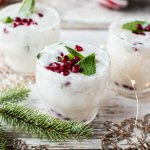 Great recipe–perfect for parties and romantic dates! Love this one Tieghan! It will be on the summer menu for sure! Wow, this is awesome! I’ve never heard of a chelada but I know I want one! And I totally know what you mean about the liquor store. I’m 24 but people tell me all the time when I buy alcohol that I look like I’m 18 haha. It’s so awkward! tequila soaked pineapple? we’re in! don’t worry you’ll start to feel more comfortable at the liquor store. 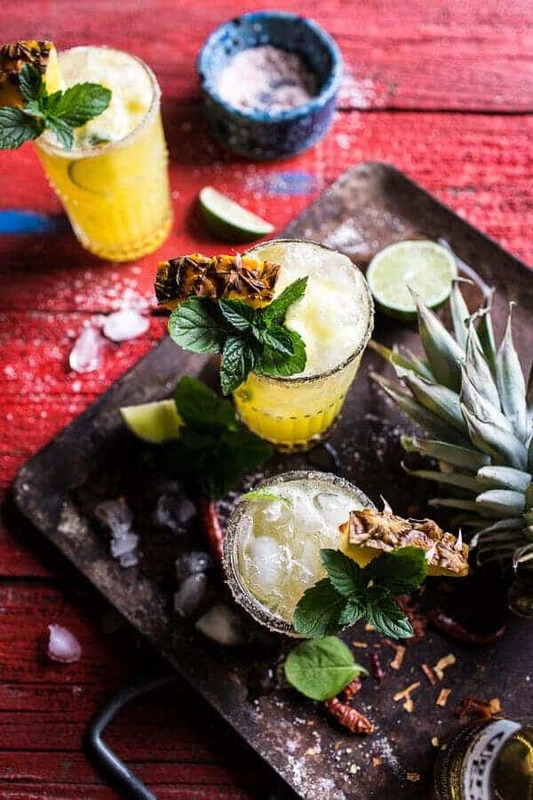 (we didn’t mean for that to sound weird but it did) we love a good cocktail so we are super excited for what this summer has in store for us on your blog!! Thank you so much! Hope you had a great Cinco De Mayo! Bring on the drinks!! These look phenomenal! Thanks Annie! Happy Cinco De Mayo! Even though I don’t drink, the colors of this are so gorgeous I just had to comment! Love the salt on the rim, too! Boozey pineapple for the zing. This is my kind of cocktail! 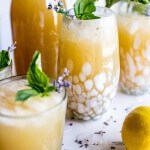 Such a gorgeous & refreshing looking cocktail!! Thank you so much, Marla! Always love looking through you CO photos on insta! This is on my Mother’s Day menu, along with your Cuban Frita burgers, a corn and zucchini parm saute, and a strawberry upside-down cake. Bring on tomorrow! This looks amazing. But, the calorie count posted of 473 kcal seems a bit high especially when it looks like one will not be enough! 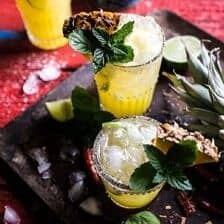 The original Cooking Light recipe is listed as 111 kcal, add 1/2 cup pineapple at 40 kcal and optional tequila at 63 kcal per ounce, I calculate 182 or 214 kcal (if you use 1/2 or 1 oz tequila) which would then make this a lower calorie drink. Use low calorie limeade and its even less! Thanks for your website, it is absolutely gorgeous. Cheers!